A problem in the use of macroalgae for biofuel is that harvesting of seaweed is generally seasonal, and there is a need to preserve and store seaweed to supply year-round production processes. Ensiling is a widely used preservation method in agriculture, but there is little research on ensiling seaweed. 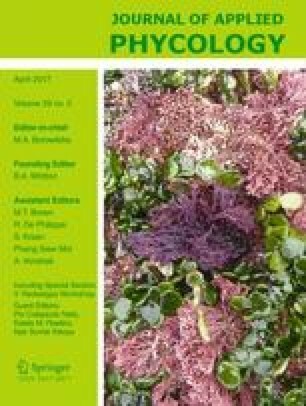 The changes in ash content, higher heating value (HHV) and dry matter (DM%) of algal biomass together with mass loss (ML) during ensilage for a year was studied for two species of seaweed, Laminaria digitata (LD) and Palmaria palmata (PP), with and without the addition of Lactobacillus plantarum. The mean ash content of the two species was significantly different (LD 24.3 % and PP 18.0 %) and remained constant after 90 days ensiling. The mean HHV before ensiling for PP was higher, 14.2 kJ g−1, compared to LD, 11.9 kJ g−1. Both the species (P < 0.05) and ensilage period (P < 0.05) had a significant effect on HHV. The overall DM% of the ensiled LD (22.4 %) and PP (22.0 %) were similar with a gradual increase in the DM% after 90 days ensiled. There was no effect of the ensiling with or without L. plantarum on DM%. There was a continuous wet matter loss during ensilage, and although the HHV of the ensiled wet biomass increased as the macroalgae became drier over time, the energy available from each kilogramme of wet macroalgae ensiled declined over the year to 78 % in LD and 59 % in PP. This work was supported by the EPSRC project number EP/K014900/1 (MacroBioCrude: Developing an Integrated Supply and Processing Pipeline for the Sustained Production of Ensiled Macroalgae-derived Hydrocarbon Fuels).